People normally associate Mardi Gras with beads, booze, and gut bombs, but Fat Tuesday, as it's called, doesn't have to blow your diet out of the water. 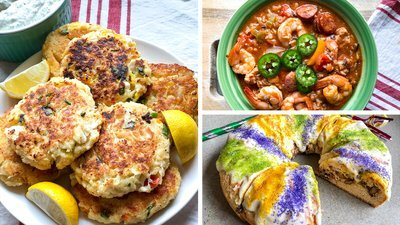 Enjoy your favorite Cajun flavors with these three celebration-worthy recipes! Kick off the festivities with these crab cakes. They're easy to throw together using canned lump crab meat, and they cook in just minutes in a nonstick skillet. Pair them with my healthy homemade tartar sauce for a diet-friendly take on this classic tasty treat. Nonfat Greek yogurt is a healthy alternative for a variety of dips and dressings and a higher-protein substitute for sour cream. Paired with tart dill pickles and spicy Dijon mustard, this tangy tartar sauce is bursting with flavor and ideal for your favorite seafood delights. For the main course, it's hard to beat a hearty jambalaya! This flavorful take on the classic recipe gets extra protein from chicken breast and added fiber from wild rice. My husband says this is the best jambalaya he's ever had, and I humbly agree. Make sure to use a Cajun seasoning you love and trust. My favorite is Bearded Butcher Blend. What Mardi Gras party would be complete without king cake? This protein-packed version has only 5 grams of sugar and a surprising 14 grams of protein per slice. If you've never tried this New Orleans tradition, you're in for a treat. King cake is a warm, doughy roll surrounding a rich pecan and raisin filling packed with delicious brown sugar and butter flavors, all drizzled in a sweet glaze. Traditional king cakes are decorated with Mardi Gras colors: purple, green, and gold. Don't forget to hide a plastic baby inside! According to tradition, whoever gets the slice with the baby has to host next year's party.